MasterLube is ready for your fleet of vehicles no matter how big or small. We take pride in maintaining commercial and private fleets. Convenience – Your drivers are busy, we understand that, which is why your drivers don’t need an appointment and can be in and out of our shop in as little as ten minutes. Taking less time away from their already busy schedules. With five Lube Centers, two Hand Car Washes, and the Glass Doctor, we are able to provide multiple services throughout Billings & Laurel. Visit our locations page for more details. Vehicle History Records – MasterLube keeps accurate records of all services provided. These records stay with the vehicle, and they allow us to provide proper services for your vehicle as recommended by the manufacturer. We also report all service to CarFax so your records are kept and easily accessible through the free myCarFax app. We accept all major credit cards and checks. And for those who prefer to be billed, we have accounts that can meet your billing needs. Electronic Invoices – Provide us with an email address for your fleet manager and we’ll email a PDF copy of the invoice at the time of service. No more tracking down driver copies or wasted paper! Custom Accounts Tailored to Your Specifications – Our computer system can be set to help fleet managers meet their needs as they see fit. Allow your drivers to authorize any service at their discretion or require prior approval for anything but a basic oil change. By letting us know what we services we can perform for your vehicle, it saves confusion in invoicing, and less headache for you. Trained and Experienced Staff – Our managers, techs, and service staff are top notch! Our employees receive year-round training. Auto Glass – We can replace all auto glass, fix dingy headlights, and replace a window at your office. All of our windshields come with a one year replacement guarantee, plus free windshield chip repair. Rock chips can be repaired at all Mastlerlube and Glass Doctor locations. For more information on our glass services, visit billingsglassdoctor.com. 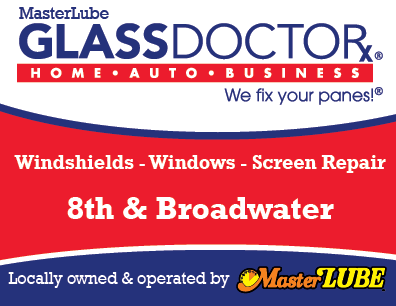 Glass Doctor of Billings is a partner of MasterLube. Car Wash – Let our Hand Car Washes make your vehicle shine! We can wash the outside, inside, or both. We also do complete automotive detailing at our Billings Hand Car Wash. And now you have a second option to keep the exterior of your vehicles clean at our recently opened Hand Car Wash inside the Laurel MasterLube. Preventative Maintenance Services – MasterLube can provide your fleet with a variety of services beyond the basic oil change! Complimentary Services Between Oil Changes – Think something needs a look? Tires need air? Out of washer fluid? Come by for a complimentary “courtesy check” at any time. Fluids are checked and topped off free of charge. We can also inflate tires, test your battery, and review “check engine” codes at no charge. Every service includes vacuuming of your floor boards and washing the exterior windows. Our fleet services have proven to be an exceptional program for all fleet types. For more information, please call our office at 406-248-8871.